Plans to build up to 1,500 homes to the south of Melton, as well as delivering key sections of a southern link road for the town, have been submitted for approval. 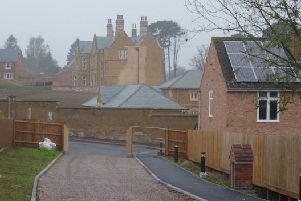 If approved, the scheme submitted by Davidsons Developments Ltd and Melton Mowbray Town Estate would form a large part of a proposed ‘Melton south sustainable neighbourhood’ as outlined in Melton Council’s draft Local Plan. As part of the proposals new link roads would be created between Burton Road and Dalby Road and Kirby Lane and Leicester Road. A new primary school, with capacity for 425 pupils, and a new ‘local centre’ comprising a convenience store, four retail units, a day nursery, medical centre, pub/restaurant and a community building would also be provided along with new areas of open space. Vehicular access to the 72-hectare development site would be provided via Dalby Road, Kirby Lane, Sandy Lane and a new roundabout on the A606 Burton Road. The development would be built in phases, starting in 2017 and ending around 2029. It’s the largest planning application the council has received since it launched a public consultation on its draft Melton Local Plan (Emerging Options) in January. A key consideration of this draft blueprint for the Melton borough was where 6,000 or so new homes should be built over the next 20 years. The next stage of the Local Plan process, the ‘submission version’, will be subject to a further six weeks of public consultation before it’s submitted for external examination by an independent planning inspector. It’s expected the Local Plan will be adopted by the summer of 2017. It also claims the development would create between 1,850 and 2,250 construction jobs, spread over 10 years, if an average of 150 new homes were built on site each year.